This morning brought the news that Worlds Apart, the OGL (Mongoose) Traveller-based fantasy game from Joseph Browning & Expeditious Retreat Press, will be available in print in game stores in the near future. It’s also already available at Lulu, if you can’t wait until it shows up in your friendly local game store to get your sweaty little geek hands on it. 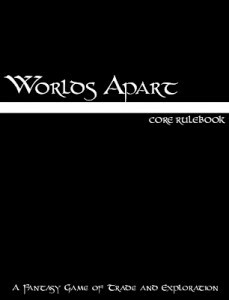 Worlds Apart has been available in PDF for a while now (including the semi-mandatory free, no art version), but having this show up in stores in print is pretty darn awesome. So if you want to check out the game before dedicating any of your precious silver to it, go snag that free version. It calls to you like the siren song of the sea, don’tchaknow? This entry was posted in Geek Materialism, Traveller, Worlds Apart on March 1, 2013 by the venomous pao. Thanks for posting this, V.P. I didn’t realize just how close this game cleaves to Traveller (e.g. it’s not a generic fantasy game, but more a science-fiction inspired one) until I started reading the rules. I’ve been digging around for a while now looking at Traveller systems for non-scifi play. Worlds Apart looks cool and I’m planning to pick up a print copy in the next couple of weeks. Have you guys looked at Argonaut by Paul Elliot? It’s not fantasy, it’s Mediterranean bronze-age sea trade using the Traveller rules. There was also Aldreth a fantasy supplement for Traveller by Nigel Hodge, and Adventurer (similar to, but predating Worlds Apart) by Doc Grognard. They’re all interesting in their own right. I think that the Traveller rule system, like the BoL system, packs a lot of oomph into 2d6 and simple rules. There was another Traveller system based game for fantasy, commercially published by Emel Akiah, called Netherell. I might pick that one up. too, at some point, but I find it difficult to justify paying $14.99 for a PDF when I can buy a print book for a few bucks more with the PDF included as a bonus. I’ve never even heard of Argonaut. But I know who Paul Elliot is, so I’m gonna have to go look at this one. Thanks for the heads up, G-Monk. I’ll have to check out the other ones, too. Though perhaps not Netherell. I like PDFs a lot, but there’s so many other things competing for my money at this point that I know I want. If you do grab it, let me know what you think, amigo. Glad to share, G-Man. Yeah, I only just realized that it’s not strictly fantasy myself. It’s awfully interesting, though! Enjoy the rest of the rules, dude.